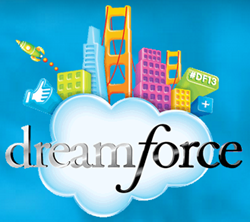 Eugene Carr, founder and CEO of Patron Technology, a Salesforce Channel Partner, will be one of the speakers at Dreamforce ’13, the annual user conference featuring Salesforce product experts sharing best practices, how-to’s, expert panels, and case studies. The enterprise cloud computing event of the year, which attracts the industry’s best and brightest, will be held in San Francisco November 18-21, 2013. Mr. Carr’s session, titled Sales Performance — Bigger, Better Pipeline with Accurate Customer Data, will be held on Wednesday, November 20 from 11:00 AM to 12:00 PM in Salons 10, 11, and 12 at the San Francisco Marriott Marquis, Yerba Buena. Joining Mr. Carr on the panel will be Brett Stineman, software product marketing and management at Salesforce, and Dave McDermott, sales enablement management for Kelly Services. Mr. Carr will share Patron Technology’s experience using salesforce.com’s tools to accelerate the growth of PatronManager CRM, Patron Technology’s integrated system for box office ticketing, professional marketing, and donor database management. ABOUT PATRON TECHNOLOGY: Patron Technology, LLC was founded in 2001 by industry veteran Eugene Carr. PatronMail, its first flagship product, is used by organizations across the U.S. and abroad. PatronManager CRM, launched in 2010 and developed in partnership with salesforce.com and the Salesforce Foundation, is a 100% cloud-based system that integrates box office ticketing and subscriptions, donor database management, email marketing, and staff collaboration on the Salesforce platform. With PatronManager CRM, organizations can sell more tickets, provide better patron service at the box office and beyond, target their marketing and fundraising efforts more effectively, and make their organization more efficient. The company presents a regular schedule of live emarketing seminars across the country, monthly email newsletters, blogs, and live educational webinars. ABOUT EUGENE CARR: Eugene Carr, founder and CEO of Patron Technology, has been an innovator in online emarketing and ticketing for 15 years. In 1996, AOL invested in his first Internet company, CultureFinder.com, an award-winning nationwide online ticketing service. In 2001, Mr. Carr founded Patron Technology and in June 2010, in partnership with salesforce.com and the Salesforce Foundation, launched PatronManager CRM. Mr. Carr’s latest book is Breaking the Fifth Wall: Rethinking Arts Marketing for the 21st Century (2011).